Bridalwear brand Eternity Bridal are launching their new Adrianna Papell Platinum Destination collection for the first time in the UK and it has an incredible price point. Beautifully beaded and intricately detailed these modern designs combined with simple styling offer brides a clean sophisticated look that’s perfect for a destination wedding. The new collection comes at an amazing value with prices starting at £249 to £329. 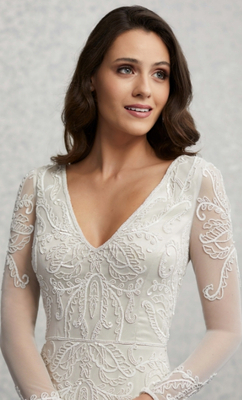 Giles Turner from Eternity Bridal told us: "We are so excited to launch Adrianna Papell Platinum Destination at LBFW, this collection is great value for money and the styling is simply exquisite." Make sure you’re registered for London Bridal Fashion Week so you don’t miss out. Want to see more collections? Check out a sneak preview of Alan Hannah’s 2020 collection.